Only a couple weeks have passed since my last display post but I have enough new photos collected to fill another one, so let's get to browsing. Last display post I shared a Cover Girl display with three bright polishes in it; I saw a different one with a trio of classic colors at a different Meijer. Shades here are: Speed of Light, Red Revenge, and Nemesis. An endcap at Walgreens was like a mash up of the two shelf top Cover Girl displays. It had all six of the (I assume new core) polish colors: Mutant, Red Revenge, Nemesis, Fury, Nuclear, Speed of Light. My CVS had all six shades of Essie Summer 2015, tucked in a narrow display I stumbled across next to the false eyelashes. I've made several forays to Five Below since my last display post; my role as a mule (aka International Unicorn Relocation Specialist) for the Five Below Group Buys group on Facebook demands it. Without a tip from another member of that group, I would probably have overlooked the two newest Fresh Paint colors, Shake It Off and Blank Space, as they were slipped into the bins with no signage to indicate they were new or part of a collection, and they're not especially eye catching. I can only imagine there will be two or three more colors with names inspired by Taylor Swift that will pop up soon. Shake It Off is a light dusty rose creme, and Blank Space is a pale greige creme. Also at Five Below, I saw the two additional new solar polish colors for this summer that I was on the lookout for as of my last display post. Comet Mebrois the blue in the front of this bin; Pluto 4ever is the light orange in back. While looking for the solars, I came across a new Funky Fingers patriotic glitter topper, 'Murica. Also just dumped in random bins, there were two other new Funky Fingers that would appear, based on their names, to be from the same collection as the three Disney-themed ones that appeared in stores back in April. Still no signage indicating what the collection might officially be called, and these two new ones weren't even but in bins next to each other, much less next to the first three. Celebration (which shares a name with the town Disney built in Florida near Walt Disney World) is an orange shimmer. Mad Tea Party (a ride in both Magic Kingdom at Walt Disney World in Florida and Disneyland in California) is a pink and lilac glitter topper. I find it frustrating that if I'd only procrastinated about swatching the first three (Wishes, Off to Neverland, and Fantasy Land) I could do the whole collection at once. Unless there are even more coming, that is; with Funky Fingers, who the heck knows. Up near the register in the store I first spotted them in but later found in the regular polish bins were two scented glitter toppers, Alex's Lemonade and Alex's Pink Lemonade, a tie in with the same children's cancer charity that Five Below has done polishes with in previous years (including at least two others called Alex's Lemonade). I thought new solars, a new holiday glitter topper, two charity glitter toppers, and a mysterious Disney collection should be enough Funky Fingers for a while, but no, just the other day I spotted three more colors I'd not seen before, all with cat-themed names and no signage about what the collection might be. I'm undecided if I should swatch these now and risk more showing up later or what. Cat-a-tonic is a purple creme, Check Meowt is a purpley pink creme, and Hiss and Makeup is a peachy pink shimmer. At CVS, the Milani endcap had a small display for the Dolci Bronze collection tucked into one side. There was one Color Statement polish here, not surprisingly called Dolci. Walgreens had a new Orly Color Blast display themed around Disney's Belle of Beauty and the Beast. There are two different sets of four minis for $14.99 and six medium size bottles (they're only 11 ml, not the 15 ml I consider the standard for full size) for $6.99 each. The mini set on the left contains Enchanted Rose, Magic Mirror, Lumiere's Light, and Positively Primeval Gaston. The bottles in the center are (left to right in front row) Enchanted Rose, Break the Spell, Crazy Old Maurice, Tea with Mrs. Potts, Nose in a Book, and Positively Primeval Gaston. The mini set on the right has Bonjour, Belle of the Ball, Be Our Guest, and Nose in a Book. As a Disney fan, this collection annoys me. The color palette seems quite similar to the Frozen collection from this past spring, dominated by pink, blue, purple, and peach. This assortment of shades seems to have even less to do with the movie than the Frozen ones did. Where is the yellow of Belle's ballgown? Only on display and the packaging, not in the polish. The polish called Belle of the Ball is pink. Pink! That's not right. Belle does have a pink dress, but her ballgown is yellow. There was a yellow polish in the Frozen collection, so I know they can make Color Blast in that sort of shade. The peach for Gaston—what's that about? His skin color? A rich red like his tunic would have been a much better choice. Light teal for Maurice? Nope. That needed to be white for his hair or at the very least a warm tone like his clothing in the movie. I just can't with this collection. Nose in a Book is probably the most fitting shade; Belle does wear a blue dress while reading in the movie. As random as the other colors are for the theme, that was probably accidental. Last display post I shared a shelf top display with the Sally Hansen Beachside Astrologer collection that I saw at KMart. This has since also shown up at CVS and Walgreens in a endcap display which also includes other products, among them six of the newer Complete Salon Manicure core colors: Hello Pretty, Orchid Me Not, Mardi Grape, Scalet Lacquer, Greenlight, and Blue Chip. At Walgreens, I found the Sally Hansen Pearl Crush display I'd been searching for. If the Sally Hansen folks have to keep introducing new lines, and it's clear that they do, I'm glad they've at least used this same rectangular bottle sytle for a lot of the recent ones; that makes for much less chaotic Helmer drawers. There are eight shades of pearly glitters here: Oy-ster It Up, She Sells, Lady Crab, Rainbow Fish, Shell & Tell, Mer-mint, Silver Scallop, and Clam Digger. Also from Sally Hansen, I saw a Color Xpression display with new shades of Xtreme Wear plus new Big Kwik Dry Top Coat. I spotted these first at Walgreens and later at CVS (where the display had a black base). Left to right: Bare Hug, La Vida Polka, Sun Spots, Dabbler, Green Thumb, Pin-k Point, Royal Hue, and Orchid Around. I've pretty much stopped going to Walmart because it's generally a wasted trip what with the random way the stores are stocked and the huge mess the beauty section often devolves into thanks to feral customers, but I did stop into one the other day since it was right on my way to somewhere else. I found the Salon Perfect Neon Pop display. It was picked over and all the limited edition colors were gone, but I did appreciate that there were two solid pieces of advice printed on the display: "Neons dry matte—use top coat for a glossy look" and "Apply a white base coat for even brighter neons". True and true. In my last display post, I shared a SinfulColors Spring Fever display at Meijer that had some of the spring toppers as well as the summer Graffiti Bomb and Piñata Blast ones in among a jumble of other colors. At a different Meijer recently, I saw a similar assortment of shades with a Street Fusion display card. It was something of a mess, and I just walked away after a quick snap and scan rather than trying to figure out if there was anything new in there since I already had all the toppers. I found a much better organized SinfulColors sidekick at Walgreens. This was called Street Fusion: Tokyo Lights, but had a different product assortment from the shelf top display with the same name I saw at Rite Aid a while back, including some new polish colors. Top row: 24/7, Decadent, Ruby Ruby, Decadent, Keira Blue (new, x2), Pink Ansen (new, x2). Second row: Bright Lucite (new, x2), Mint Tropics (new, x2), Fuji Fuji (new, x2), Mamasita (new, x2, seen in other displays too). Third row: Rise & Shine, Hazard, Sky Tree (new, x2), Jolt (x2), Lavender (x2). Fourth row: Pink Happy Thoughts (x2), Baila Baila (new, x2, seen in other displays too), Vacation Time (with empty slot next to it, maybe should also be Vacation Time? ), Pride, clear Coat. Bottom row: Fierce Fiesta (new, x2, seen in other displays too), Curry Up (x2), Cherry Blossom (new, x2), Otaku Anime (new, x2). When I did my last display post, I was concerned I'd already missed the Studio M summer display due to some random bottles that were sitting on an endcap at my Meijer store. I hadn't missed it (though I still don't know where those two endcap colors came from, as they're not in this display). The Colors That Pop display has the usual assortment of core colors, repromotes, and shades never seen before in a Studio M bottle (though most are familiar from the Color Club brand, which shares a corporate parent with Studio M). Top row: Blue Lagoon (new), Lust, Purple Crush (new), Neon Glow (new), Hot Zone, Volcanic, Girl's Night Out (new), Paradise (new). Second row: Power Pink, Neon Pink, All That Razz, Glitter Twinkle, Bright Night, Lightening Blue, Age of Aquarius, Energy Star. Third row: Sparkle and Soar, Orange Sunset, Orange Hot, Psychedelic Scene, Neon Caution, Lemon Drop (new), Jade, Neon Greenlight. Fourth row: Youthquake, Lovin' It, East Austin, Perfectly Pink, Hot Zone, Wing Fling, Peace Out Purple, Grape Escape. Fifth row: Neon Greenlight, Glitter Envy, Abyss, Glitter Outer Space, Blue Funk, Blue Lagoon (new), Lust, Purple Crush (new). Sixth row: Wham Pow, Glitter Solar, Jackie Oh, Neon Pink, Infusion, Glitter Astral, Vintage Vamp, Frenzy. Seventh row: Neon Caution, Glitter Envy, Energy Star, Blue-ming, Evolution, Total Wow, Blue Funk, Grape Escape. Eigth row: Orange Hot, Lovin' It, Paradise (new), East Austin, Girl's Night Out (new), Power Pink, All That Razz, Punked. Bottom row: Perfectly Pink, Neon Pink, Neon Glow (new), Power Pack, Wicker Park, Frenzy, Total Wow, Lightening Blue. Ulta had an adorable set of Ulta brand mini polishes in bright summer colors packaged in a little clear-sided paint can. I have had this in my hands on a couple of occasions but so far have managed to put it back down, telling myself surely I have cremes in these colors already. 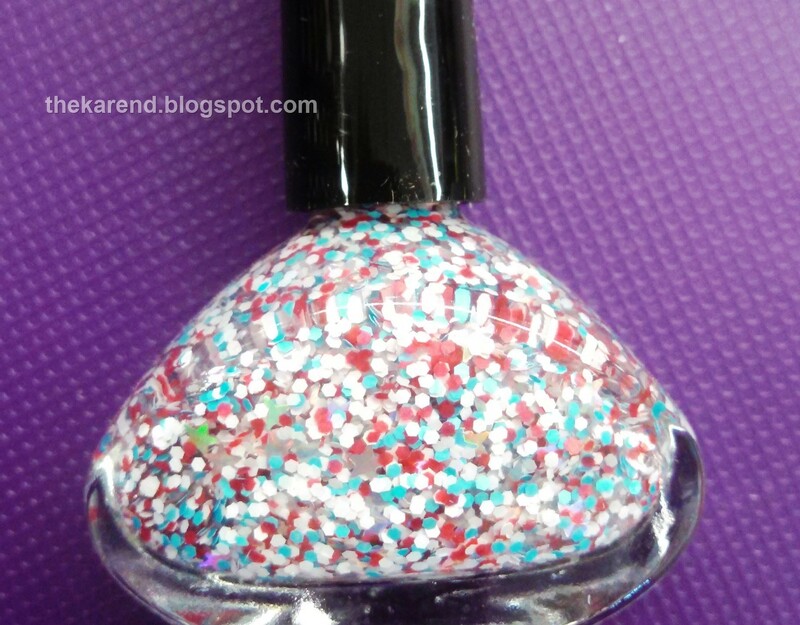 Things I am looking for for my next display post: Sally Hansen Instant Ombre glitters (which have already annoyed me with that name but which I will undoubtedly buy anyway) and the still elusive shelf top SinfulColors display with the Piñata Blast glitters. I have seen photos of these so I know they exist, they just haven't turned up anywhere I've been yet. Last summer, I swatched eight glitters from the CinaPro Nail Sugar line, which had appeared at various Sally Beauty stores I frequent. At the end of that post, I remarked that per a press release I'd found online there were two more colors in the collection. At that time, I had no idea where to find them. A little while back, I was browsing the Loxa Beauty website for Morgan Taylor colors since I've yet to find them in any stores around me (they're probably in one of the pro stores; I never was tempted to get a fake ID to drink when I was teenager, but I do admit to idle thoughts about getting a fake cosmetology license). Of course I looked at what other polish they had, and there were the elusive CinaPro Nail Sugars. They were expensive, $13.98 a bottle (compared to under $10 for the ones at Sally), but I really wanted to complete my set so I ordered them along with the Morgan Taylor colors I wanted. The two shades I was missing were Creamcicle (I'm guessing they can't spell it Creamsicle due to trademark issues) and Salt Water Taffy. The bottles above have a bit more of a story behind them than I'd planned for; when I opened the shipping box when they arrived, I smelled polish; one of the Morgan Taylor bottles in my order had broken and gotten purple shimmer all over. I was able to clean up the intact Morgan Taylor bottles pretty well, but the handles of the CinaPro colors did not take kindly to acetone and deformed and got sticky and basically glued themselves to the glass. The good news is that I emailed Loxa Beauty explaining what happened, and customer service sent out replacements for the broken bottle as well as the two CinaPros right away. I was very impressed by their quick response; in just a few days I had my new bottles safe and sound. Creamcicle was described in the press release that alerted me to its existence as an "orange jelly base with fine particles of orange and gold". Hmm, not quite, unless they were using "fine" to mean "attractive" rather than "small in size". This has medium gold metallic hexes, small copper metallic hexes, and small soft orange and vanilla matte bars in an not especially orange jelly base. I swatched Creamcicle on its own and over three different base colors. Top to bottom: 2 coats of Creamcicle alone, Morgan Taylor My Carriage Awaits plus 1 coat Creamcicle, Morgan Taylor Watch Your Step Sister plus 1 coat Creamcicle, Bonita Prima Donna plus 1 coat Creamcicle. I did one coat of clear topcoat on all nails; two would have been better to really smooth things out. Due to the way the light is hitting the metallic glitter, some of them look dark, but they are not; they're all gold or copper. The second CinaPro, Salt Water Taffy, was described in the press release as "a clear jelly base with fine silver glitters". It has a clear base, yes, but there is no silver to be seen, just white and blue matte glitter. The white is in the form of hexes from very tiny to rather large, while the blue is all small bars. I took the same approach to swatching this as with Creamcicle: on its own and over three bases. Top to bottom: 2 coats of Salt Water Taffy alone, Sally Hansen Complete Salon Manicure Highway to Heaven plus 1 coat of Salt Water Taffy, Sally Hansen Complete Salon Manicure Teesta Turquoise plus 1 coat of Salt Water Taffy, Sally Hansen Complete Salon Manicure Dark Denim plus 1 coat of Salt Water Taffy. All have one lyaer of clear topcoat and as with Creamcicle, two would have been better. The glitter payoff for both of these is excellent, though I wouldn't wear either of them alone (I like to layer anyway). Getting the largest white hexes out of Salt Water Taffy was a bit of an exercise, but that's to be expected with that scale of glitter. I'm happy to have completed my Nail Sugar set with these two. It's fun to have a more obscure set like these (Googling "cinapro nail sugar"—with the quotes—gets me well under a thousand results, compared to over two thousand for "sally hansen luxe lace"). I mentioned last week that I was still waiting for one more winner in my giveaway to contact me. Yesterday she did, just in time, as I was set to contact the backup choice today. So now I can announce all the winners! Prize #1: Funky Fingers Glitter Toppers went to Cindi in Texas. Prize #2: Salon Perfect Neon Collision Collection is heading to Sweden to join Emelie and perhaps make an appearance on her blog, Nails and All That Jazz. Prize #3: SpaRitual Trio flew east to New Jersey to be a part of Alina's stash there. Prize #4: Formula X Sextet was won by Stacy in Minnesota. Prize #5: Orly Trio joined Prize 1 in going to Texas (it's a big, populous state); these will be gracing Elizabeth's nails there. Prize #6: OPI Anniversary Duo will be crossing the border to Canada to be with Holly in Ontario. Prize #7: Sephora by OPI Quintet is also going to Canada, but to Manitoba and Christine's stash. Prize #8: Selections from Essence Aquatix went to Kathleen in Connecticut. Prize #9: Essie Trio Featuring Flakies is the third package to go to Texas; they're now with Mel of Delicious Color (or soon will be). Prize #10: Butter London Fash Pack Set went west to Colorado and Christina's stash. Prize #11: Rescue Beauty Lounge Duo made record time and is already in Denmark with Maria of Maria's Nail Art and Polish Blog. Prize #12: OPI Mad as a Hatter and Absolutely Alice will be going to Arkansas to live with Sarah (in a small city that coincidentally I once visited as part of a job I had years ago). Congratulations to the winners, and I thank each of you who took the time to enter and especially those of you who added comments to your form, from a simple thanks to constructive criticism. I would not kept up this blog anywhere near as actively without the encouragement of those of you who read and comment. 1) Eight of the winners got their first choice prize; the remaning four got their second choice. 2) The most popular prize overall was #12, the OPI Alice in Wonderland glitters, with 18.5% of 1st Choice entries, 13.4% overall. #10, the Butter London Fash Pack, was a close second, with 12.8% overall, though it was third when considering just people's 1st choices, where it had 12.5% to 14.6% for the Salon Perfect prize pack. Third place overall was a dead heat between #2 Salon Perfect, #4 Formula X, and #7 Sephora by OPI. 3) #5 Orly was the least popular overall, with only 5% of entries. I'm curious how that might have been affected if that prize had more bottles in it, as when ranked on an "entries per item" basis, it was not at the bottom, #1 Funky Fingers was. By the time my 6th blogiversary comes around, I will be retired, which means I should have more time for swatching and blogging but will definitely have less money for buying polish. There will still be giveaways, but whether they will be quite as big as this most recent one, I'm not sure. My current plan is to finally, finally do that blog sale I've talked about forever, and use those proceeds to fund my adventures here. I even set up a storenvy store before the whole Stripe debacle, so now I'm back to figuring out the best way to unload my excess pretties. I'd welcome comments with any suggestions you might have. Where do you look for stash sales? Do you like to buy single bottles or lots or both? If you've done a blog sale, what worked and didn't work for you? I'd love to hear any thoughts. I know it's Wednesday, which should mean a nail wheel, but since we in the U.S. had a holiday on Monday, it's effectively Tuesday, so there is no wheel this week but instead the post I planned to do yesterday but didn't because I had a lunch meeting and left earlier than usual to try and beat a big rainstorm (which I didn't quite manage, but at least I only had to deal with sheets of rain for the last third of my commute instead of the whole thing). I included Ministry of Beauty (MOB) artificial nails I saw at Meijer in a display post back in April. I didn't buy anything from that display at the time I spotted it, thinking about all the Maybelline Nail Falsies I snapped up when they went on clearance which have been sitting in my stash untouched. My resolve lasted until I stopped at Meijer near the end of April on my way to visit my mom in Illinois (I figure I might as well combine a restroom stop with nail polish display hunting, since not all Meijer stores have the same stuff at the same time, and most Meijers also have gas so it's like three birds with one stone if I'm due for a fill up as well). I'd been too busy to do my nails before I left, so was extra susceptible to the lure of the fakes when I saw the MOB display again at this store—I could go from plain to fancy nails in almost no time by just sticking these on. Thus I found myself back out in my car with a box of the Ultra-Reflect nails in the purple/olive/gold multichrome colorway (I didn't see any names on the boxes for any of the designs, though it's possible I missed them). I went ahead and put them on right there in the car. Like the Maybelline ones, the nails are numbered on the underside so it's easy to keep the sizes straight and make sure that the nails on one hand are the same sizes as on the other hand. Unlike some of the Maybelline ones, I didn't notice any burrs on the edges of any of the nails that I needed to file off. I think I could have chosen better sizes in some cases, but that's not the nails' fault. In most cases, I was able to get a good fit, though the base curve of the fake nails was more square than my own base curve, which left a bigger gap than I liked (the sides of the nail touched before the center when I was snugging them up to the base of my nails). Still, they were so shiny and distracting, I don't think the gap was especially noticeable in anything but macro photos. These very nearly were the shortest-lived NOTD ever when at my next stop, I broke a bottle of nail polish at at Sally Beauty and got bright pink all over my fingers and nails (it was the OPI anniversary creme, for the record). Since I happened to be traveling with a full complement of removers and tools, I was able to clean up with minimal damage to the nails, though I did end up removing bits of the shiny finish in some spots along the tips. No matter, they were still pretty, and pretty distracting what with the shifting colors. I'd intended to just wear these for the weekend but liked them so much I kept them on for most of the workweek, too. The adhesive on these tabs was different than other nails I've used before; when it failed, it didn't let go all at once leading to nails popping off, but rather let go gradually, so I'd have a loose nail, like a loose tooth. That was good, since it let me remove and replace the sticky bit before I actually lost the nail. (The pack came with three full sets of adhesive tabs, so there were plenty of extras.) In the five days I wore these, I had to re-attach three or four nails. The shiny surface of the nails held up pretty well; by day five I noticed some very thin scratches and some spots at the tips where the caoting seemed to be peeling away, but some of that could be due to exposure to the remover when I was cleaning up the polish spill days before. I got a lot of comments and compliments while wearing these; they are quite eye catching. I loved the adhesive tabs that came with these. Even though I feel like I had to re-stick more nails than with other brands, I thought it was worth it for the lower profile look and the gradual way they came off. When it was time to remove them, they came off easily with no damage to my nails. Depending on how well the glue was holding, I either tugged the nail off by sliding it down toward the tip of my finger or used a metal cuticle pusher tool to loosen and remove the nail. Any adhesive left after the fake nail was gone just rolled off my natural nail like rubber cement. Based on how well I liked these, I wore a different design shortly after I took these off, but I'll save those for another post. Apparently not everyone liked these as much as I did, as when I went back to Meijer to get more, they were already on clearance. I initially passed on getting anything from the FingerPaints Tie Dye Revolution collection, as they are all cremes and goodness knows I have cremes galore in my stash already. It's getting harder and harder to justify why I might need to, for example, pick up an orange just slightly lighter than seven other oranges already in my possesion when there is no finish difference to point to like I can with shimmers or glitters. So I snapped a photo of the display and moved on. All was well until on a later visit, I saw the mini set. Buying minis doesn't really count, right? And it had instructions for nail art on the box, so that makes it educational, and learning is good. So I picked up the mini set, and then since that meant I would have a majority of the non-white colors in the collection, I pretty much had to get the orange and the green in full sizes. I did, however, manage to leave the white in the store, because it is a core color and I told myself I can get it anytime (also I already have what even I can see is possibly an insane number of white cremes). I set out to recreate the nail art per the instructions on the mini kit. By step 3, I was already distracted and thus failed to read the "wipe stick clean" part (which really I should have known anyway), which meant I made a big mess instead of nail art so took it off and tried again. I wasn't overjoyed with my second attempt either, so what you see below is my third try, when I used thicker application and a lighter drag than my first two. It's still not a match for the nails on the box, but for all I know those were made with Photoshop instead of polish. Frustrated, I abandoned the idea of doing all my nails up fancy and just went with solid colors on the last three. Far Out Fuchsia is not what I consider fuchsia but rather a reddish pink; I used two coats for my swatch. Yellow Out Man is indeed yellow; it was a three-coater. Be Hippy is a deep sky blue; this was nearly a one coater and let very slight staining when I took it off. I tried to do a similar look with the green and orange, but the formula on the green didn't cooperate; it was more runny than the others, so I resorted to single color swatches. I did a white base on my index finger first, then added Peace Love & Green; two coats on the white nail and three on the others. The white base definitely brightens it up; apparently this one has more neon pigment in it, as it dries a touch less glossy than the pink, yellow, and blue did. If you look closely you can see a hint of visible nail line in the photos; it wasn't so obviously to the naked eye. The orange, Tie Dye Tangerine, was back to the same sort of formula as the first three, as evidenced by the fact it's not really evident that I did the white base on my index finger approach again like with the green. It's one coat over the white and two coats on the other three fingers, and they all look pretty much the same to me. If the green had a less sheer formula like the rest of its siblings, it would be my favorite of the group, as I do like the color. As it is, my favorite is the orange; such a happy summer color. I did pick winners for my 5th Blogiversary Giveaway. All but one winner has gotten back to me. I'll give her a few more days then redraw for that prize and then get an entry up about the results, including some notes about the relative popularity of the prizes because that sort of data interests me.